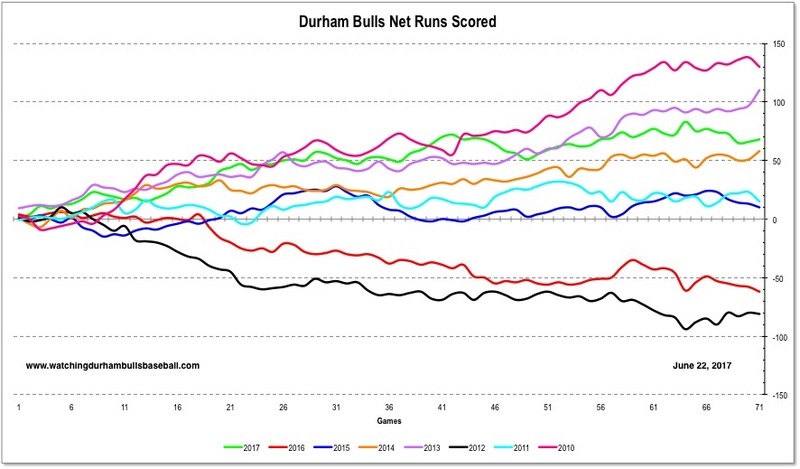 Hard to believe that the Bulls are halfway through their season, but they are. In AAA only 142 games are played in a season and yesterday afternoon was game 71. Let's take a look at where they are. 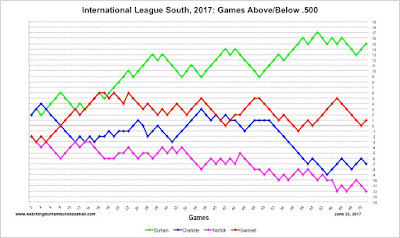 Most importantly, they are in first place in the South Division of the International League. Standings. 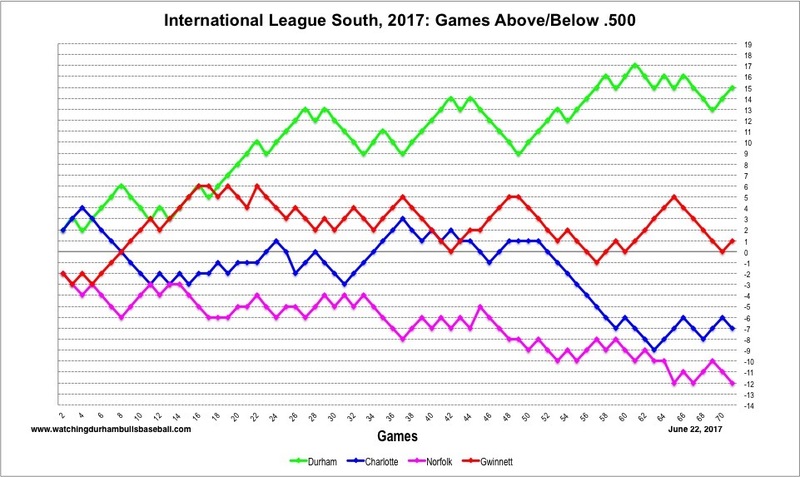 And they are 7 games ahead of Gwinnett. 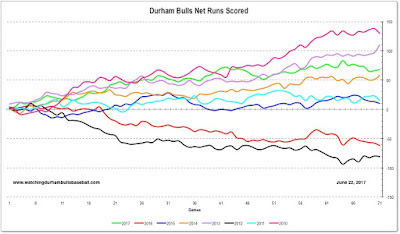 The Bulls' run differential (runs scored minus runs allowed) reflects the team's performance. Nothing like the 2010 or 2013 teams, but still pretty darn good. 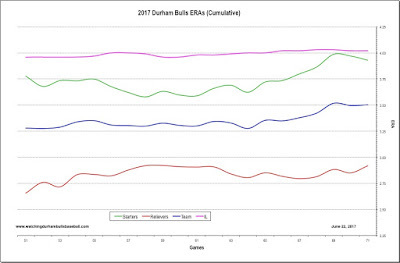 Overall, the Bulls team ERA of 3.50 is 2nd best in the IL and much better than the league average of 4.02. However, the starting pitcher performance is worrisome. That gets a bit more worrisome if you look at the starting pitchers' Game Scores. Game score is one of those newish stats (it's in the box scores of every game these days) that crunches together innings pitched, hits, walks, runs and strikeouts into a single number. A score of 50 is average. 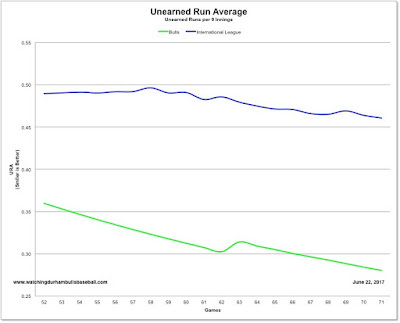 As this chart shows, 7 out of the last 15 games have been below average. The hitters are doing a good job. By the way, we use OPS simply because it's better known and we are looking for trends. 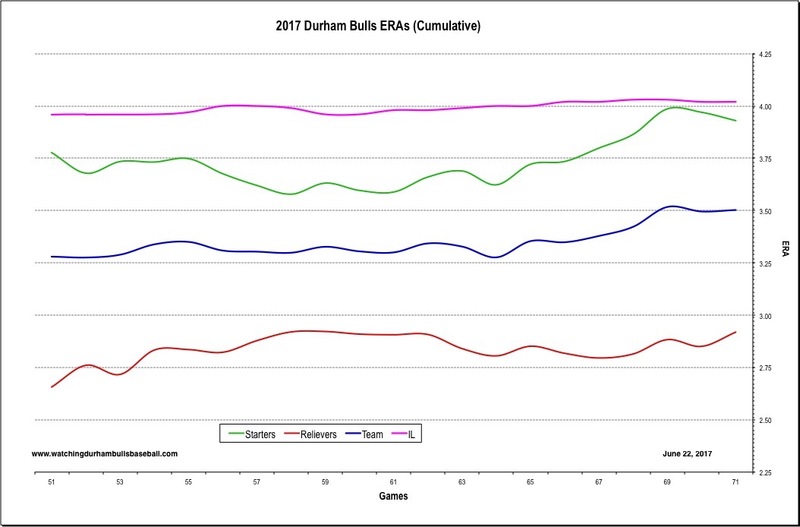 Although wOBA is probably a better stat, the trends are about the same. 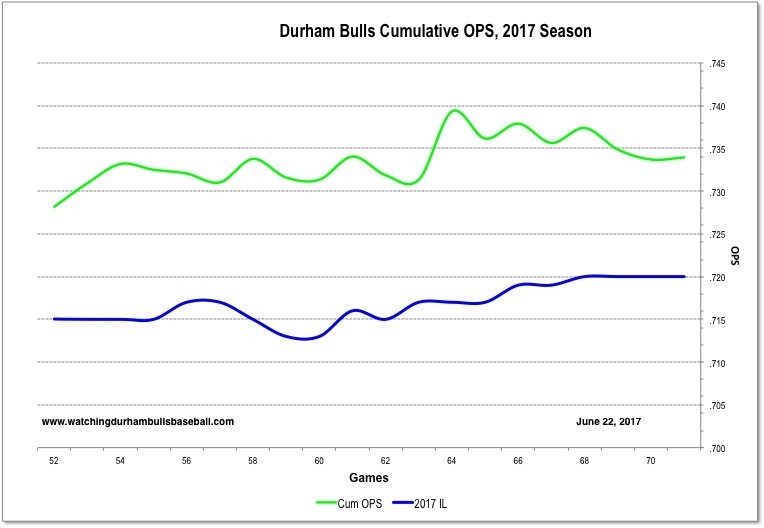 Bulls' OPS ranks 5th in the International League. 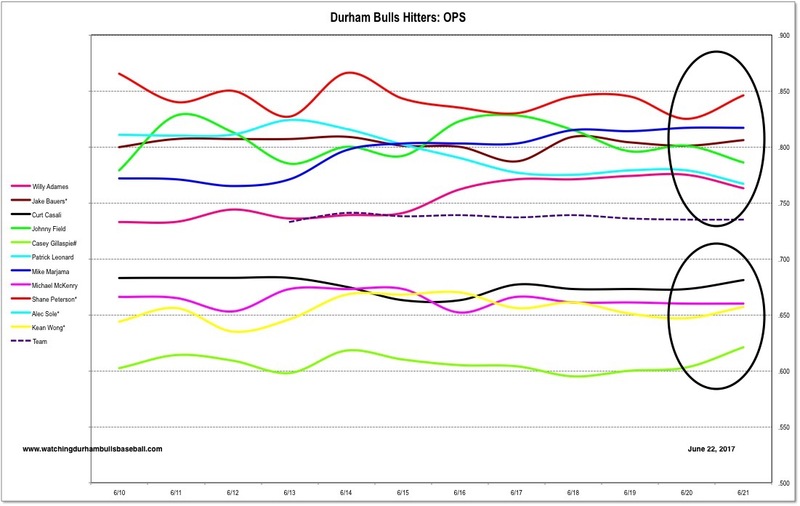 Recently we started tracking the OPS of individual Bulls and some interesting patterns have shown up. Note that .700 is considered "average" and .800 "above average". 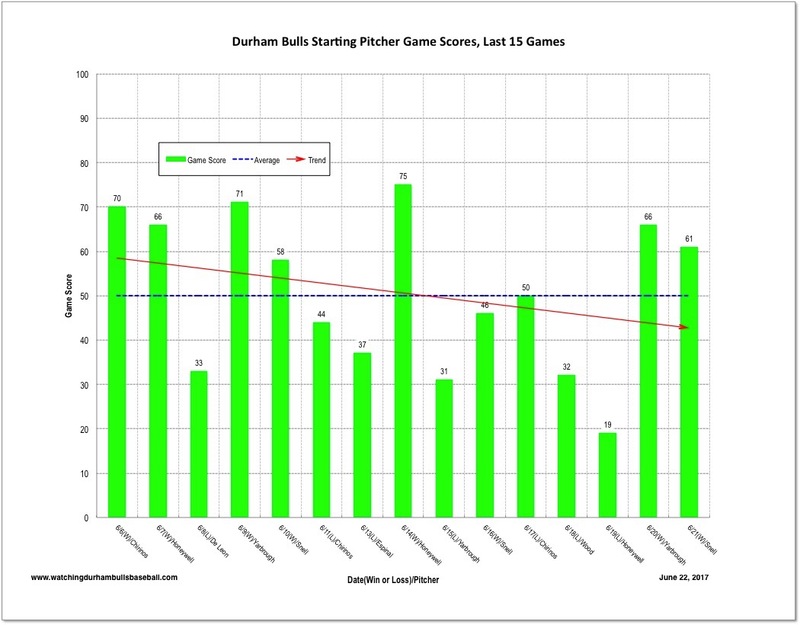 Willy Adames, for example, has seen a nice improvement up to the .763 point. Shane Peterson is having a terrific impact, staying very close to the .850 level. Johnny Field, Mike Marjama, Jake Bauers, and Patrick Leonard make up a very impressive 5-player cluster. The second cluster of Curt Casali, Kean Wong, Michael McKenry, and Casey Gillaspie are players we want to see doing much better. Not shown is infielder Alec Sole, whose OPS is .310. 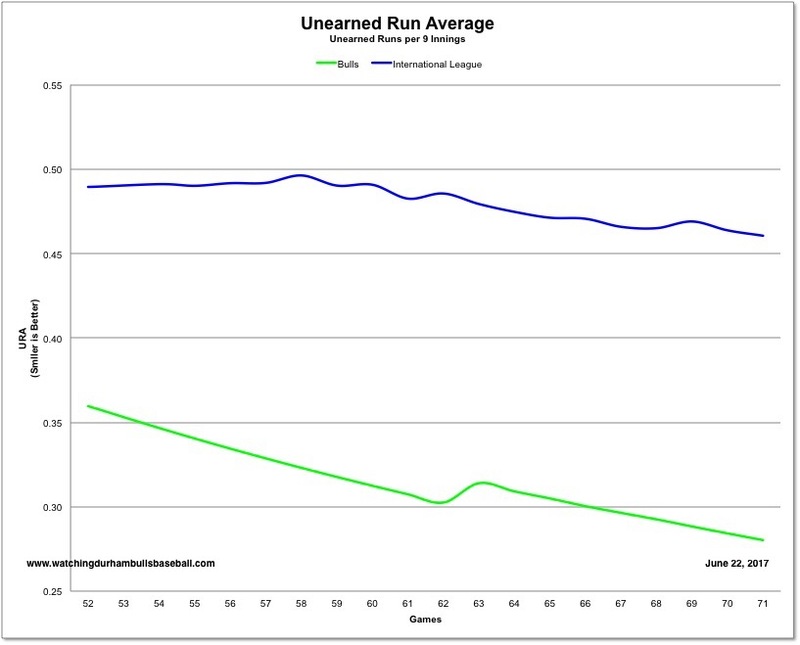 Recently, we invented a "back of the envelope" measure of fielding effectiveness, the "Unearned Run Average". The idea is that if the pitcher is responsible for the earned runs, then the rest of the team is responsible for the unearned runs. And it turns out that there are differences among IL teams. 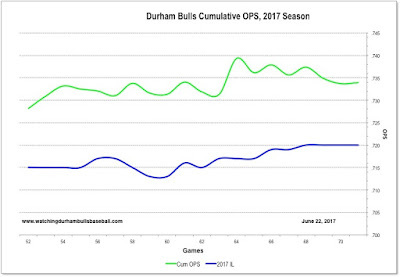 This chart shows the IL average and shows that the Bulls have been doing very well this year. 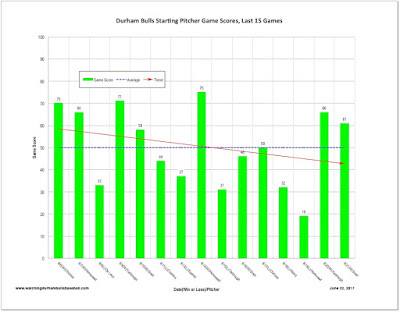 In the last month, only two unearned runs have been scored, even though 14 errors were recorded.